Are you wanting to give people the best impression of your home, and are getting sick at the sight of all the mess on your driveway from weeds to algae? Sounds like you need Wet & Forget’s solution for getting your driveway looking its best without compromising its integrity. Whether it’s moss, weeds, algae or lichen it can seem like your driveway is always in bad condition – but it doesn’t have to be. Although pressure washing is often the most popular solution to clearing up your driveway by removing and killing moss, weeds, algae and lichens this could be doing more harm than good. Too much pressure on your driveway can actually damage its integrity depending on the material. Along with hand washing it is also often a time-consuming task, especially if you have quite a large drive. Harsh chemicals may also seem like a good option, but these can sometimes lead to staining and toxicity of a driveway. So, how can you beat these pesky problems? This is where Wet & Forget steps in as the perfect solution to ridding your driveway of moss, algae and lichen problems. At a gentle pH of 8, which is as close to neutral as you can get, you can rest assured that any nearby plants won’t be affected and that your driveway won’t be left damaged. Simply apply it once to the area, and then leave it for the elements to break down the moss, algae, weeds and lichens over time - killing them for up to a year. Following the first application, any further maintenance will be a much shorter process, meaning you can easily stay on top of it. No longer will you be in dismay over a messy drive, as with the lichen, algae, weeds and moss eradicated you can finally have pride over your driveway. You needn’t worry about the long-term effects on your pets either, as due to being acid, bleach and caustic free it is completely harmless to them. Just keep them off the treated area until it is dry and rinse off with fresh water if they accidentally come into contact as a precaution. Wait for a break in the weather before you start to clean your driveway, an upcoming dry spell of 2-3 days is ideal. Soak your drive thoroughly with the solution and let it dry for four to five hours - during that time, Wet & Forget starts to get on with the job of cleaning your driveway, leaving you free to relax. And that's it! There's no need to scrub or rinse Wet & forget away, simply reapply should anything reappear to maintain your beautiful driveway. 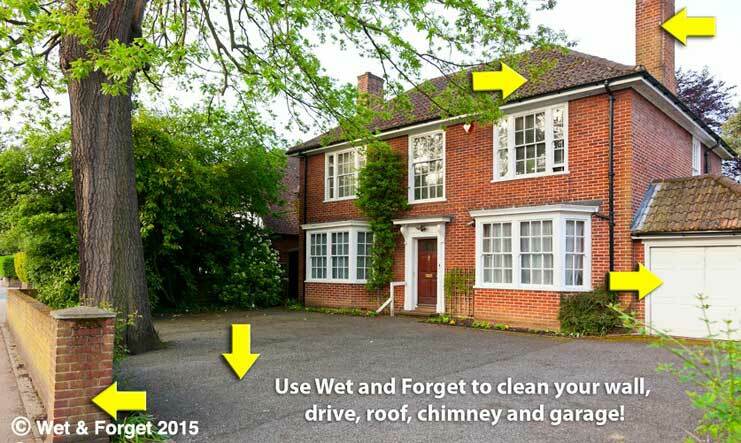 For those wanting to make cleaning your driveway even easier, try Wet & Forget Rapid. The built-in nozzle and pre-mixed formula makes treating your drive for moss, algae, weeds or lichen a piece of cake - especially for those with a large area to cover. You'll also have the peace of mind of knowing that you've eradicated your problem in the most hassle-free way imaginable.